Sorbitol was reported as one promising platform compounds as a C6 sugar related derivative from biomass cellulose due to its high oxygen content with six hydroxyl groups. Our previous work has reported the selective hydrodeoxyenation (HDO) of sorbitol into long alkanes such as pentane and hexane (C5/C6) over carbon supported ruthenium-molybdenum catalysts. Here, the effect of acidic pretreatments of those carbon catalysts on the performance of HDO reaction was studied in detailed. 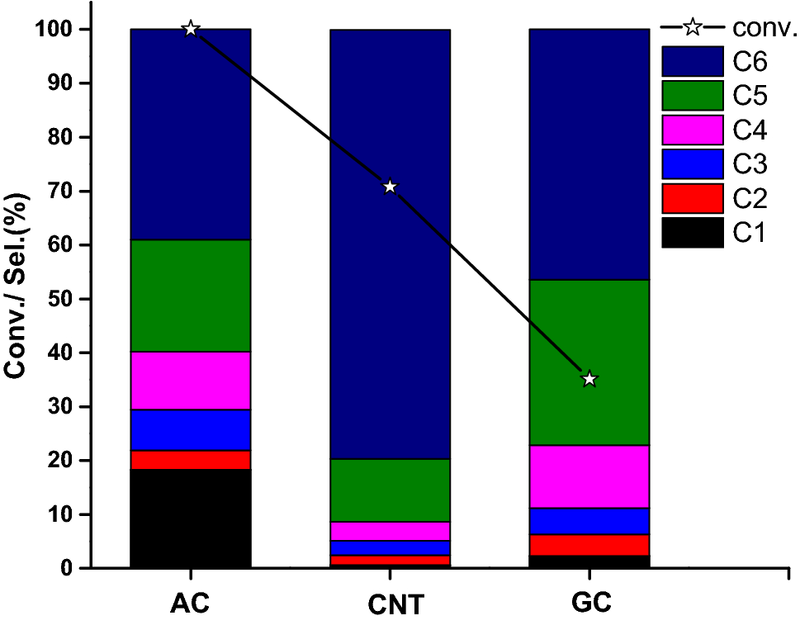 The result indicated that carbon support pretreated by phosphoric acid presented much phosphorus groups, but the carbon support pretreated by nitric acid presented high graphitization degree. Moreover, the phosphoric acid pretreated catalyst (RuMo/C–P) obtained high HDO performance in the sorbitol conversion with 79.7% carbon yield of C5/C6 alkane (pentane and hexane). Finally, detailed characterizations (N2-adsorption, XRD, HRTEM, XPS, XRF, Raman, NH3-TPD, Py-IR spectrums, etc.) were performed over relevant catalysts for correlating their catalytic and physicochemical properties. The online version of this article ( https://doi.org/10.1007/s42452-019-0434-3) contains supplementary material, which is available to authorized users. Fuels and valued-chemicals from biomass resource are most important topics in green chemistry, based on the fact that biomass is the only promising alternative carbon resource. The challenge to reconstitute biomass resources is their polyoxygenated nature (CHO)n, which requires the transformation of C–O bond for oxygen removal or substitution [1, 2, 3]. However, the thermodynamic data showed that the bond-dissociation for C–O bonds (CH3–OH 381 kJ/mol, CH3CH2–OH 381 kJ/mol, CH3CH2CH2–OH 381 kJ/mol) were higher than that of C–C bonds (CH3–CH3 368 kJ/mol, CH3CH2–CH3 356 kJ/mol, CH3CH2–CH2CH3 381 kJ/mol) [4, 5, 6]. Thus, the control of relative activity in cracking reaction of C–C and C–O bonds is one of the most important themes of the design of hydrodeoxygenation catalysts as most metal catalysts can crack both C–C and C–O bonds [7, 8]. Recently, bimetallic metal/metal-oxide catalysts have been shown to be very promising for the catalytic HDO of biomass-derived oxygenates into valued chemicals and fuels. Tomishige et al. reported Ir-ReOx catalysts for the conversion of biomass derivatives into bio-alkanes, and found that the Re species played critical role in the synergistic HDO process [9, 10, 11]. Huber et al. reported bimetallic Pt-ReOx catalyst for biomass sugar and polyol into bio-alkanes and -alcohols [12, 13, 14, 15, 16]. Chemically speaking, those catalysts presented metal/acid bifunctional catalytic roles. The metal sites can catalyze the hydrogen uptake, dissociation and spillover onto the metal-oxide in vicinity. It was generally believed that H2 spillover can facilitate the reduction of metal-oxide species. Moreover, the reduced metal-oxide species can act as Lewis acid sites for the C–O bond cracking via dehydration reaction [17, 18, 19, 20]. Our group aimed to directly convert biomass into renewable alkanes on trickle-bed reactor over carbon supported Ru–Mo bimetallic catalyst due to the relative cheap and hydrothermal stability of materials. To date, several attempts have been made to optimize the hydrodeoxygenation performance over carbon supported catalysts, such as adjusting the Ru/Mo composition and screening additives [21, 22, 23, 24, 25]. The purpose of this study was to investigate the influence of acid pretreatment on physicochemical properties and hydrodeoxygenation performance of carbon supported Ru–Mo bimetallic catalysts. Wherein, activated carbons prepared by chemical activation using nitric acid and phosphoric acid contain a relatively higher amount of nitrous or phosphorus complex, which could achieve the desired properties such as high oxidation resistance and high surface acidity [26, 27, 28, 29]. In addition, such carbon supported catalysts have been successfully used as acid catalysts in the dehydration reactions [12, 29, 30]. Here, RuMo/C catalysts prepared from impregnation by using different acid pretreated activated carbon were employed and extensively studied in trickle-bed reactor for sorbitol conversion. Among these catalysts, the best HDO performance was approximately 80% carbon yield of C5/C6 alkane, but the inferior HDO performance was only about 55% carbon yield of C5/C6 alkane. Thus, it is worthwhile to explore the influence of carbon pretreatment. Subsequently, a series of characterization studies (N2-adsorption, XRD, XRF, HRTEM, XPS, Raman, H2-TPR, NH3-TPD, Py-IR spectrums, etc.) were performed over relevant catalysts to study the catalytic and physicochemical properties. Sorbitol was supported by Yuan-Ju biotechnology Reagent Co. Ltd. (Shanghai, China). Ruthenium-chloride-hydrate (RuCl3·3H2O), nitric acid (HNO3, 68 wt%) and phosphoric acid (H3PO4, 85 wt%) were supplied by Aladdin Co. Ltd. (Shanghai, China). Hexaammonium-molybdate ((NH4)6Mo7O24), diammonium hydrogen phosphate ((NH4)2HPO4), and melamine (C3H6N6) were purchased from Tianjin Fuyu Fine Chemical Co. Ltd. (Tianjin, China). Activated carbon (AC, 70-120 mesh, Huanneng carbon Co., Ltd., Heibei, China), multi-walled carbon nanotube (CNT, inner diameter 2–5 nm, length 10–30 um, Chengdu Organic Chemicals Co., Ltd., Chinese Academy of Sciences, Sichuan, China) and graphene (GC, thickness 0.55–3.74 nm, Chengdu Organic Chemicals Co., Ltd., Chinese Academy of Sciences, Sichuan, China) were selected as support materials. Ruthenium molybdenum carbon catalysts were prepared by sequential impregnation with 1.5 wt% Ru loading amount and molar ratio of Ru/Mo = 1 (Fig. S1). Take the RuMo/C–P catalyst as an example. Firstly, activated carbon needed to be pretreated by phosphoric acid at 383 K in condensing reflux equipment overnight, then cooled to RT, filtered and dried at 393 K overnight before impregnation. Secondly, the activated carbon was immersed into RuCl3 solution followed by ultrasonic treatment for 2 h and incipient impregnation. Thirdly, the mixture was then transferred to an oven and dried at 393 K for 12 h, the dry sample was next heat treated in a muffle furnace under a nitrogen atmosphere at 673 K for 4 h. Finally, the impregnation of Mo was carried out in the similar process. RuMo/C–N catalyst followed the sample process but selected the nitric acid for pretreatment of activated carbon. Additionally, all catalysts needed to be reduced in a H2 flow (150 cm3/min) at 673 K for 4 h prior to the reaction. 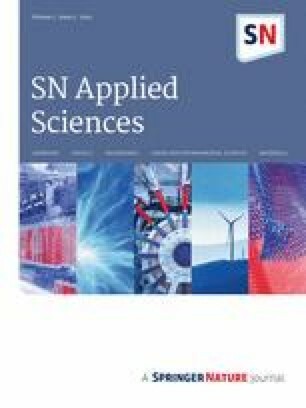 The adsorption properties of catalysts were characterized by nitrogen adsorption at 77 K. To further determine the surface properties of fresh and spent catalysts, Fourier transform infrared spectroscopy (FT-IR), X-ray diffraction (XRD), X-ray fluorescence (XRF), Raman spectra, X-ray photoelectron spectroscopy (XPS), transmission electron microcopy (TEM), H2 temperature-programmed reduction (H2-TPR), NH3 temperature-programmed desorption (NH3-TPD) and infrared spectra of pyridine adsorption (Py-IR) were also employed. Moreover, detailed characterization information was supported in supplementary materials. Sorbitol conversion was carried out in a tubular stainless-steel trickle-bed reactor (inner diameter of 10 mm; length of 350 mm) with 4 MPa H2 pressure. Before the reaction, 4 ml catalyst was located in the constant temperature zone of the reactor and certain amount of quartz sand and quartz wool were loaded on the top and bottom of the catalyst bed as the filler materials, respectively. During the reaction, sorbitol solution (20 wt%) was pumped into the reactor at different flow rate by a high-pressure liquid pump (HPLP), and H2 flow (150 cm3/min) was purged at the same time. The set-up kept H2 pressure at 4 MPa with the use of pre-pressure controller and rear pressure and operated in the co-current-flow from top to bottom. The products here were distributed in gaseous phase and liquid phase. Where, Gaseous sample was analyzed on-line by gas chromatography (Shimadzu GC-2010, Rt@-Alumina Bond capillary column, 50 m × 0.53 mm, ± 5%) equipped with a thermal conduct detector (TCD) and a flame ionization detector (FID) via external standard method. Moreover, liquid samples were condensed and collected in an ice-water condensing tank and then weighted at Analytical Balance (± 0.5%), further detected by Waters Alliance e2695 HPLC (± 2.27%) with UV–Vis (Waters 2489) and Refractometer (Waters 2414) detector by using a Shodex SH1011 column (8 × 300 mm). 0.005 M H2SO4 as mobile phase flowed at a rate of 0.5 ml/min. GC–MS (Thermo Trace GC Ultra with a Polaris-Q ion trap mass spectrometer) equipped with a HP-INOWx capillary column was applied to analyze the species in aqueous samples. The total carbon content in the liquid products was measured by a Vario EL III elemental analyzer (± 0.2%). Figure 1 showed the N2 adsorption–desorption isotherms at − 196 °C for the different pretreated carbon catalysts. Moreover, quenched solid density functional theory (QSDFT) method was applied to analysis the heterogeneous samples, which allows reliable pore size, porosity and surface area characteristics to be calculated in the pore width range from micropore to mesoporous (0.35 to 40.0 nm) . RuMo/C presented a type IV isotherm, corresponding to a well-developed micro- and mesoporous structure, as a large amount of N2 was adsorbed in the entire relative pressure range, which was further confirmed by the higher surface areas (SBET, 1500 m2/g)and larger pore volume (Vp, 0.73 cm3/g) in the Table 1. The heterogeneous porous property wouldfacilitate the chemisorption and dispersion of metal particles according to relevant literature . For RuMo/C–P catalyst, the value of SBET and Vp slightly decreased. As to RuMo/C–N, a great reduce of micropore and mesoporous was found with only 122 m2/g surface area and 0.07 cm3/g total pore volume. Cordero et al. reported that the nitration of activated carbon with nitric acid would result to a decrease of porosity [27, 29, 33, 34]. Pretreatment carbon with nitric acid or phosphoric acid was a typical method, not only introducing oxygen-surface groups on the carbon support but also introducing a small amount of nitrogen or phosphate functional groups. Thus, the detailed elemental analysis of pre-treated carbons by XRF was presented in Table 2. For the carbon pretreated by H2O, a large amount of C, O, Cl, Ca, Si, a small amount of K, Fe, Al, P, Mg, and a trace amount of S, Ti, Na, Ba, Mn, Cu were detected, which were the mostly frequent and abundant mineral elements in natural carbon materials according to reports [35, 36]. Moreover, the mineral elements were decreased for the carbon pre-treated by acid solutions, especial the one using HNO3. Interestingly, the carbon pre-treated by HNO3 presented very trace amount of N element (0.001%) on the support, but the carbon pre-treated by H3PO4 showed a large amount of P element (3.005%). According to previous reports, the presence of P element could be attributed to the surface phosphorus complexes formed during the activation step, which seem to be stably bonded to carbon as they do not elute after washing and ultraphonic processes [35, 36]. XRD analysis was also carried out to investigate the structure of catalysts in Fig. S2. Unfortunately, no obvious difference was observed among the catalysts due to the amorphous property of AC and fine particles size [23, 31, 37]. 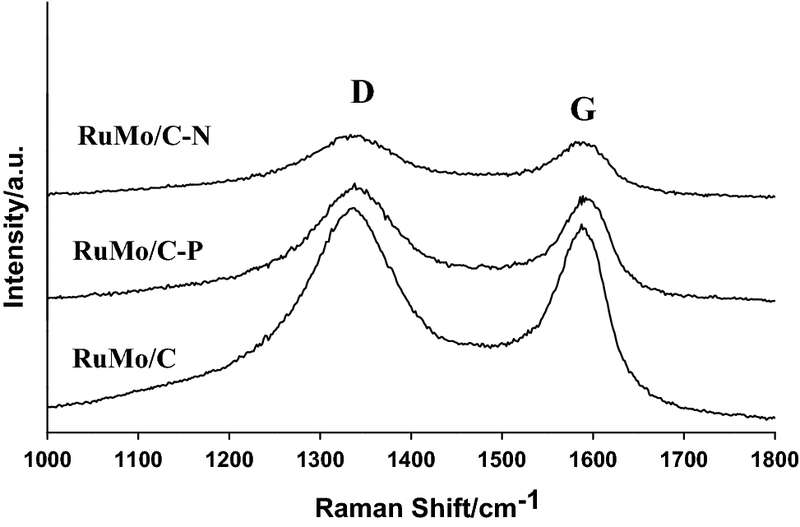 Moreover, Raman spectra of samples were also supported in Fig. 2. The spectra of ordinary carbon materials exhibited a D band around 1360 cm−1 due to the disordered arrangement and low symmetry of graphite lattice structure. An additional G band at around 1580 cm−1 is a scattering peak attributed to the stretching of all sp2 atomic pairs on carbon ring or long carbon-chain in graphite. The value of La (R = ID/IG, La = 44/R) was calculated in Table S1 to characterize the degree of graphitization level. The La value of RuMo/C, RuMo/C–P and RuMo/C–N were 20.9, 21.6 and 22.4, respectively, indicated the acid pretreatment enhance the graphitization of carbon catalysts. To further identify the chemical states of relevant catalysts, XPS was employed with Gaussian–Lorentzian peak shapes as fitting method and Shirley line as background. Figure 3a showed the spectrum of C1s region. The main occurrence in samples could be attributed the species of Csp3 (aliphatic carbon in hydrocarbonates, C–C–, O–C–, etc.) and Csp2 (–C = O, –C = C, etc.). Figure 3b confirmed the presence of several different O species in the O1s region: (1) 529.2–530.6 eV (metal oxides, Mo–O), (2) 531.0–531.9 eV (C=O, O–C=O*, P–O), (3) 532.0–534.5 eV (C–OH, C–O–C, *O–C=O), (4) 534.5–536.1 eV (H2O) [25, 31]. Figure 3c showed the Ru3p spectra. Whereby, the main peak (based on Ru 3p3) at around 462.3 eV observed on catalysts could be attributed to the metallic Ru (Ru0) and the broad band at around 464.0 eV could be corresponded to high valance of RuOx species according to relevant reports [38, 39]. Figure 3d presented the Mo3d spectra. The high binding energy peaks at around 233.6 eV could be attributed to the Mo6+ species and the lower binding energy peaks at around 232.0 eV could be assigned to the reduced metal oxide species (MoO2). Moreover, P2p and N1s spectra of relevant catalysts were also supported in the Fig. S4. A broad band at around 133.0 eV in P2p spectra reflected the reduced P species (e.g., C–PO3 and C2–PO2 133.1 eV) and the other smaller band at around 134.4 eV could be corresponded to P (+ V) species (e.g., H2PO4− 134.6 eV). While, the peaks at around 399.0 eV in N1s spectra suggested the appearance of reduced N species (e.g., nitroso 400.1 eV, pyridinic 398.9 eV) according to reported literature . TEM experiments were conducted to study the dispersion of metal particles. As shown in Fig. 4a–c, the RuMo/C catalyst presented a good dispersion of metal particles with an average size about 3.4 nm, which could be the result of high surface area and pore volume. But better nanoparticle dispersion with average size about 1.9 nm and 1.0 nm was also found on the catalyst after acid pretreatment on RuMo/C–P (Fig. 4d–f) and RuMo/C–N (Fig. 4g–i) samples, respectively. 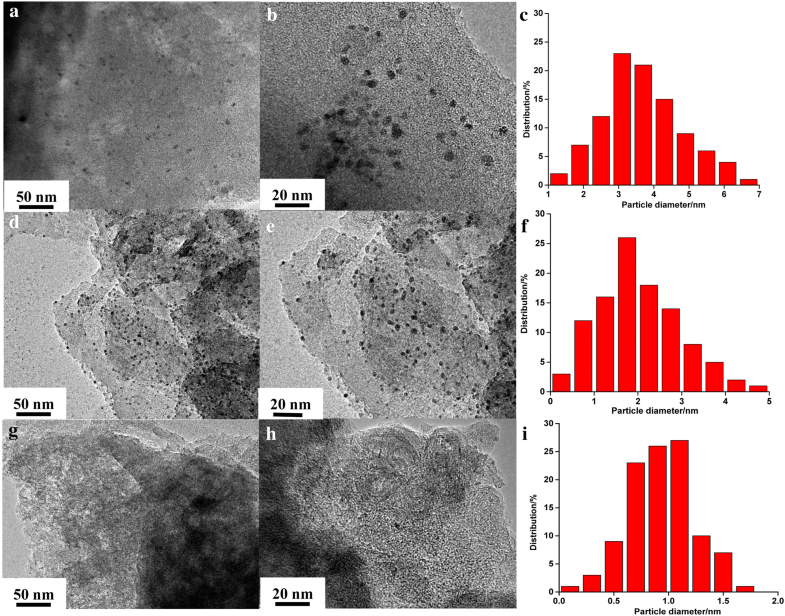 Although the N2 adsorption–desorption characterization suggested the change of carbon microstructure of supports after acid pretreatment, the TEM results still showed high dispersion of nanoparticle on relevant catalysts. The TPR profiles of series catalysts were conducted to provide further evidence for the change of activity sites. 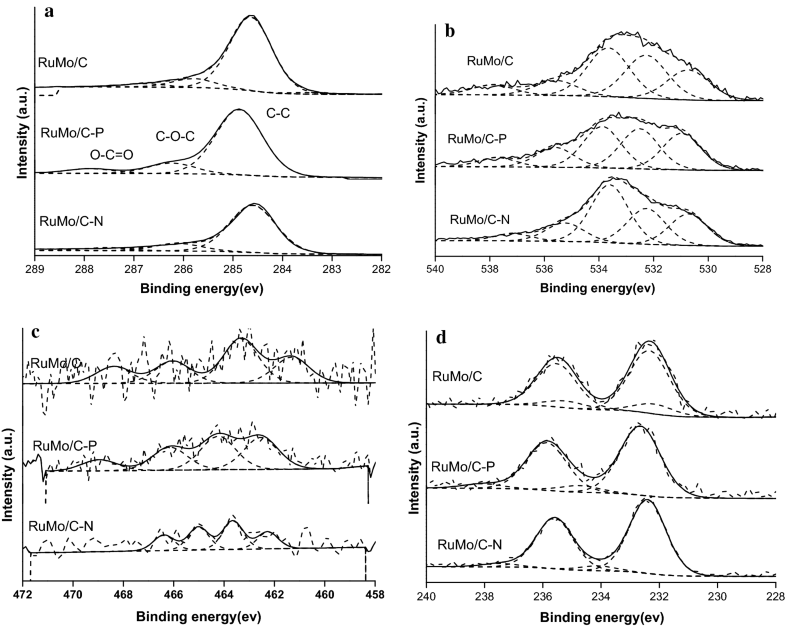 The comparison of RuMo/C with those of Ru/C, Mo/C and AC itself was supported in Fig. S5. Ru/C showed a main peak below 400 °C, and Mo/C gave a big peak above 500 °C. While, RuMo/C presented abig peak located at a slightly higher temperature than that of Ru/C catalyst, and the peak assignable to Mo species was nearly disappeared, which suggested that the reduction of Mo species could be promoted by the presence of Ru via H2 spillover [17, 20, 21, 23, 40]. The evaluated value of Mo species based on the H2 consumption was determined about + 4, which was also supported by XPS result. Moreover, Fig. 5 showed the TPR profiles of RuMo catalysts. RuMo/C-P showed a low temperature broad peak was at the range of 150–400 °C, and a high broad peak evolving at above 500 °C. RuMo/C–N also presented a low temperature peak was at the range of 200–400 °C, and a high broad peak evolving at above 500 °C. Generally, the low temperature peak could be attributed to the reduction of RuOx and MoOx species, and the high temperature peak could be assigned to the decomposition of oxygenate-containing groups [22, 25]. 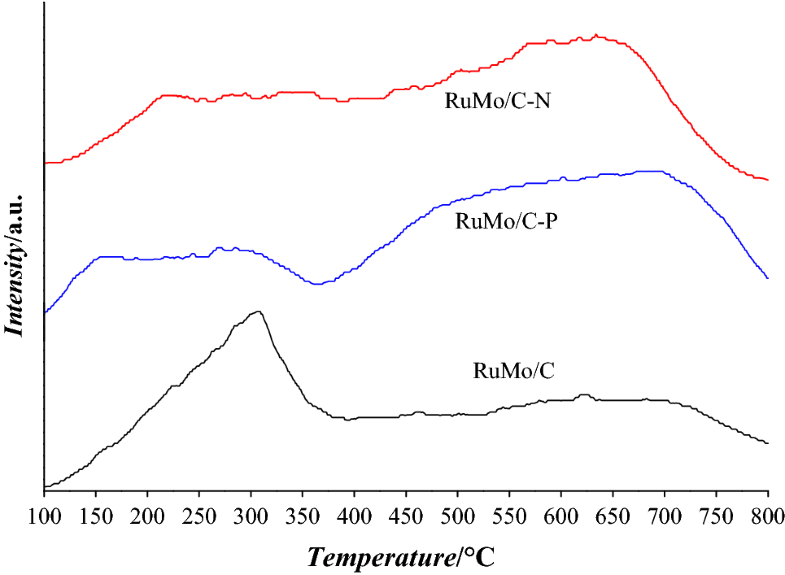 Obviously, the range of these peaks did not overlap with RuMo/C catalyst, indicating that the reducibility of RuMo bimetallic catalyst was affected by the acid pretreatment of carbon supports. Acid pretreatment would enhance the acid character of carbon catalysts, which rendered them interesting catalytic properties and has been already reported in the previous works [24, 25]. Here, surface acidity of catalysts was evaluated by NH3-TPD. As shown in Fig. S6, all catalysts presented weak-medium acidity with two distinct NH3 desorption peaks at around 420 and 570 K . To further investigate the percentage of Brønsted (B) and Lewis (L) acid sites in the total number of acid sites, the spent samples were measured by Py-IR spectroscopy at different desorption temperatures (Table 3). Chemically speaking, the Brønsted acid sites could be attributed to the hydroxy groups on the support and easy to be dissociated at high temperature. While, the reduced Mo species can act as Lewis acid sites or electrophilic sites to polarize and facilitate the cleavage of C–O bond [2, 17, 20, 42]. Ru-based catalysts were well known to be active in the aqueous-phase catalytic transformation of biomass feedstocks, and our previous work have reported the selective HDO of sorbitol into C5/C6 alkane over carbon supported ruthenium-molybdenum catalysts, which presented excellent stability for 7 days without obvious decline (Fig. S7) [21, 22, 23, 24, 25, 31]. Here, the effect of carbon pretreatments were studied in detailed. As shown in Table 4, all ruthenium-molybdenum catalysts exhibited low selectivity to short alkanes and high selectivity to long alkanes, indicated higher HDO performance than that of monometallic Ru/C catalyst. Whereby, RuMo/C showed stable HDO performance with 62.6, 68.5 and 66.3% yields to C5/C6 alkanes at 280, 300 and 320 °C, respectively. RuMo/C–P also presented lower C–C cracking property with high C5/C6 alkanes yields of 70.4, 74.2 amd 79.7% at 280, 300 and 320 °C, respectively. However, RuMo/C–N presented inferior performance in the cleavage of C–O versus C–C bond with 62.2, 57.9 and 55.0% yields to C5/C6 alkanes at 280, 300 and 320 °C, respectively. Thus, those results indicated that the acid pretreatment of carbon supports can affected the HDO performance of relevant RuMo catalysts. Generally, it was supposed that the selective of C–O/C–C bond cleavage was attributed to the bimetallic Ru–MoOx structure on catalyst which suppressed the C–C cracking reaction and enhanced the HDO performance . Furthermore, the activity test of monometallic Ru catalysts supported on various carbon materials was also carried out to study the effect of acid pretreatment. As shown in Table S2, the result suggested that the acid pretreatment can affected the C–C cracking performance of Ru catalysts with relative low yield of C1 products. As mentioned in XRF results, acid pretreatment introduced a small amount of P and N element. Thus, nitrogen and phosphorus additives were added into the Ru/C catalysts for comparative study (Table S2). For the catalyst with phosphorus additive, the selectivity for C5/C6 alkane was about 50%, slightly lower to that of monometallic Ru on phosphoric acid pretreated carbon support (Ru/C–P). While, it still presented similar products distribution with high selectivity to C1 products for the catalyst with nitrogen additive. Thus, the result indicated that the phosphorus additive has an inhibitory effect on the crack property of Ru metal. Since graphitization was detected on catalyst after nitric acid pretreatment, graphitized carbon materials [carbon nanotube (CNT) and graphene (GC)] were employed as supports to prepare ruthenium molybdenum bimetallic catalysts to further study the effect of graphitization on catalytic mechanism. Figure 6 showed the result of products distribution over catalysts with different supports. As expected, the sorbitol conversions and products distribution were influenced by the carbon materials. The CNT supported catalyst showed 70.8% sorbitol conversion and 91.3% carbon selectivity to C5/C6 alkanes in the gaseous products. While, the GC supported catalyst showed 35.1% sorbitol conversion and 77.2% carbon selectivity to C5/C6 alkanes in the gaseous products. The comparison here was at fixed catalyst volume. Thus, much less catalysts were used as the lower density of CNT and GC materials than that of AC material, which could result to low conversion at same sorbitol LHSV. Therefore, the result indicated that graphitized carbon supports have no suppression effect on the HDO performance of Ru–Mo bimetallic catalysts. Furthermore, relevant characterization of RuMo/CNT catalyst was supported in Fig. S8. HDO is a catalytic process to remove partial or total oxygenates from biomass feedstock, which involved at least the C–O bond cleavage by dehydration at acid sites and the hydrogenation of C=C and C=O bonds at metal sites. Side-reactions included the C–C bond cleavage by dehydrogenation followed by decarbonylation or retro-aldol condensation at metal sites. Thus, active and stable acid/metal bifunctional catalysts were needed. According to the result of characterization and previous reports, Ru–MoOx structure here was that Ru species are in the metallic state acted as metal sites on catalyst with nanoscale dispersion, and Mo species are partially reduced to a low valence and acted as acid sites [3, 22, 43, 44]. Moreover, the intimate contact between Ru and Mo species would enhance the synergistic effect. However, the C–C bond cleavage of Ru-based catalysts at high reaction temperatures was still challenging. The purpose of this study was to investigate the influence of acid pretreatment on the physicochemical properties and HDO performance of carbon supported Ru-Mo catalysts [12, 36, 45, 46, 47]. Whereby, RuMo/C–P catalyst presented a high selectivity to C5/C6 alkane, suggesting the low C–C cracking property of catalyst. Relevant characterizations indicated the introduction of P groups on catalyst, which enhanced the acidity of catalyst, especially the Brønsted acid. Moreover, contrast experiment also suggested that the reduced P groups could affect the chemical state of Ru and low the cracking property of catalyst [48, 49, 50, 51]. However, the effect of nitric acid pretreatment was much complex. Whereby, change of porous structure, graphitization of carbon support and reduced N groups were detected. Current work could just confirm that the graphitized carbon supports have no negative effect on the HDO performance of RuMo catalyst. Since the complex of carbon materials and challenge of in situ analysis for aqueous HDO catalytic system at present, detailed synergy catalytic mechanism will be further studied in future. In this work, Ru–Mo bimetallic catalysts prepared by using different acid pretreated carbon supports were employed in continuous trickle-bed reactor for hydrodeoxygenation of biomass sorbitol into renewable alkanes. The result indicated that the sorbitol conversion and products distribution were seriously influenced by the carbon pretreatment during impregnation. The best obtained HDO performance was approximately 80% carbon yield of C5/C6 alkane, but the inferior HDO performance was only about 55% carbon yield of C5/C6 alkane. Therefore, a series of characterization studies were performed over relevant catalysts to study the change of catalytic active sites. The result indicated that carbon support pretreated by phosphoric acid presented more phosphorus groups, which enhanced the acidity of catalyst, especially the Brønsted acid sites, and affect the chemical state of Ru and low the cracking property of catalyst. But the carbon support pretreated by nitric acid presented a change of porous structure, graphitization of carbon support and reduced N groups. These founding was important to understand the catalytic mechanism for the HDO of biomass polyol and provide guidance for the design of new catalytic formulations. This study was supported by grants from the National key research plan (2018YFB0604500), China Postdoctoral Science Foundation (207500), Scientific and Technological Research Projects of Henan Province (182102210319), Henan Polytechnic University (B2018-42), Outstanding Youth Foundation for Scientific and Technological Innovation in Henan Province (184100510013) and National Natural Science Foundation of China (51536009).